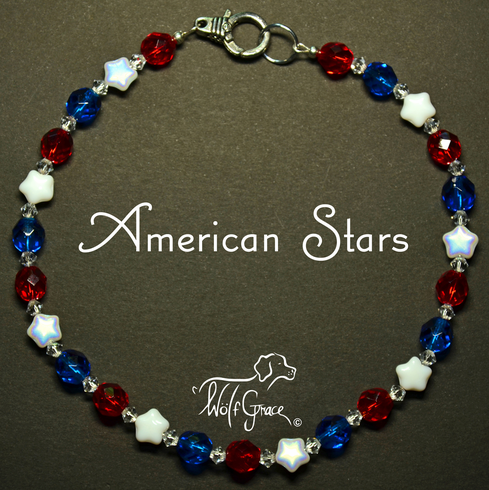 This American Stars necklace features a bouquet of our country�s bright gleaming colors! 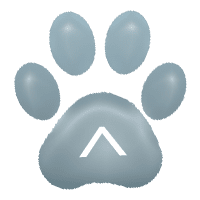 Whether in twilight or the dawns early light, this design will have your dog wagging their tail for freedom, not only on Independence Day, but also year around! The magnificent hue of 8mm round faceted Ruby Red Czech Fire Polished Glass beads, not only add a pop of contrast, but also represent the hardiness & valour meaning behind the red stripes of the flag. Mustn�t forget about the Czech Glass Star beads represent that not only the stars of Old Glory, but as well as the purity and innocence of the white stripes. The stars� Chalk White finish on one side and an Iridescent/AB finish on the other side (differences exhibited in photos) will have you dazzled with each fleck of light. The pattern just wouldn�t be complete without those bright, gorgeous 8mm round faceted Capri Blue Czech Glass Fire Polished beads, which like the blue field on the flag, symbolizes vigilance, perseverance & justice. We wanted to make sure your dog really feels the sparkle, so we added 4mm bicone Clear Czech Glass beads between each of the stars and round beads. Can you feel the bling?